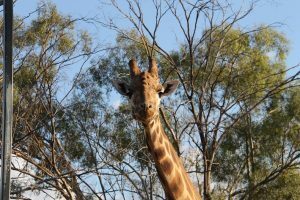 Global Travel Media » Blog Archive » JOHN ROZENTALS loves ‘camping’ at Taronga Western Plains Zoo and rates a couple of the exclusive experiences among the privileges of his life. 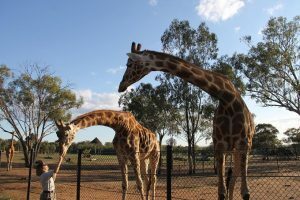 JOHN ROZENTALS loves ‘camping’ at Taronga Western Plains Zoo and rates a couple of the exclusive experiences among the privileges of his life. It’s late afternoon and I’m sitting on the deck, having a glass of wine and watching a bit of the African savannah unfold in front of me — complete with giraffes, a couple of rhinos, zebras and a host of antelope-type animals. And no, I haven’t travelled to Kenya or Tanzania, or anywhere else in sub-Saharan Africa. I haven’t even left the country. 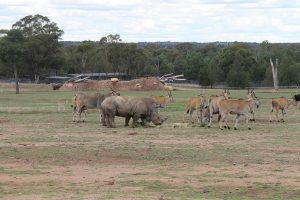 I’ve merely driven to Taronga Western Plains Zoo, very near the western NSW city of Dubbo, and been booked in for a night’s stunning accommodation in an animal-view tent at Zoofari Lodge. Did I say tent? Well, the structure is made of canvas, so I suppose it’s technically a tent, but it’s kept well off the ground and offers a degree of permanency by virtue of its solid wooden floor, its four-poster bed, its ensuite bathroom complete with classy tub and free-standing shower, and all the rest of the hotel-style paraphernalia. 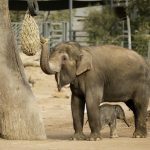 Taronga Western Plains Zoo receives more than 250,000 visitors a year. That’s obviously quite a whack, but Maddi Hanns, who helps manage Zoofari and often takes guests on the exclusive nightly and early-morning drives of discovery, reckons that 40,000 Zoofari Lodge and other overnight guests — ‘roughing’ it at locations such as Savannah Cabins and Billabong Camp — contribute nearly half the zoo’s annual intake of funds. Wow! 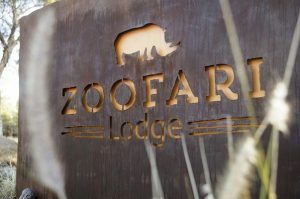 The per-adult cost of a premium package at Zoofari Lodge sounds pretty expensive at about $500 per night but becomes decidedly less so when you break it down to components. What guests get is pretty significant. 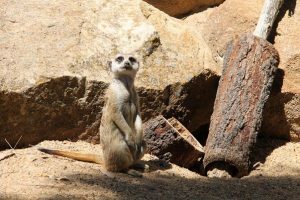 They start with more than $40 worth of general two-day admission to Western Plains Zoo. On top of that guests receive hire of an electric safari cart for a day, meaning they can negotiate in style the zoo’s exhibits which are located over more than five kilometres of well-formed roads through savannah-style grounds. Zoofari Lodge’s Maddi Hanns feeding a black rhino … the urine they spread to mark territory is caustic enough to eat steel fencing in a couple of years. Do take some time and discover what’s on during the day, which always seems plenty. There’s no point in missing a talk about a favourite animal — or something like the daily feeding of the lithe cheetahs. As well as the excellent accommodation with front-row seats of the savannah action, including animal-feeding sessions, Safari Lodge guests receive complimentary buffet-style breakfast, and for those on the premium package, also canapés and nightly wine-tasting, African-style multi-course dinner and dessert, and drinks during the meal. The lodge’s guest house, where much of the activity takes place, is a true gem. It’s a former residence, has been decorated very classily and reminds me a lot — mostly log fire excluded — of the hill stations that were created to look after senior staff in out-of-the-way places such as Malaya, western Tasmania or Vietnam’s Sapa. Lodge guests also receive discount packages to the zoo’s Bakhita’s Café and for other, usually-paid-for tours, but the real pluses come in the form of complimentary, guide-led evening and morning tours. 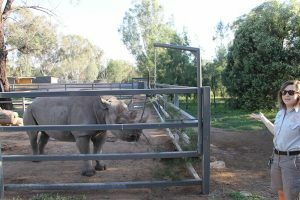 Amazingly powerful … a couple of white rhinos graze at Taronga Western Plains Zoo. from my deck … feeding time on the ‘African’ savannah. My visit to Western Plains Zoo starts with an excursion led by Stephen Fowler on a very secure, purpose-built patrol vehicle on the new ‘Lion Pride Lands’ tour. After passing through a series of security gates — no ‘Poms on bicycles welcome’ sign here — we meet the four ‘boys’, Bakari, Sheru, Virunga and Karoo, all offspring of the very virile Lazarus, who Maddi introduces us to that evening on a Zoofari Lodge ‘after dark’ special. They used to think that a lion’s mane was there for protection while fighting. They’ve realised now that its depth and lustre are symbols of testosterone and virility. On that score, Lazarus sits near the pinnacle, and zoo staff hope his male offspring emulate his record. Go ‘the boys’! 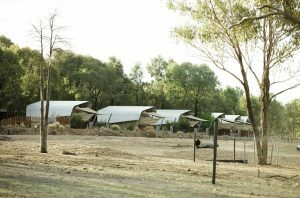 Taronga Western Plains Zoo’s Zoofari Lodge … right on the edge of the action. Image: Destination NSW. 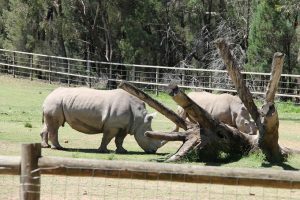 Western Plains Zoo: Obley Rd, Dubbo 2830; phone (02) 6881 1400; visit www.taronga.org.au.